Before 2017, I had been to only one march in my life. It was when I was in college, and I took a bus with my roommate from Albany, New York down to New York City for a Pro-Choice rally. It was her idea, and in all honesty, what I remember the most is the long bus ride back in the middle of the night. As an introverted, semi-aloof art major, I hadn’t found my place in the world and didn’t understand how one person could make a difference. I wasn’t raised to protest, or to even express my opinions for that matter. I just wanted to go back to my art studio and hide. Fast forward 30 years, and here I am at 49, writing about making protest signs – like I’m some sort of expert. The world is a different place, and I have finally grown up. The biggest change is that now I am a mom. I can’t hide in my art studio anymore (although I still want to). I am a role model for my children, and I want them to know that one person can absolutely make a difference, that your opinion does matter, and if you believe in something with all your heart then share it with people because even that small action can turn into something big. The other more obvious reason for my new found activism is that I am disheartened every day by our current President and the so-called leaders in charge of our country. There is no way I can be complacent. I am an average artist, but good enough to design something eye-catching that people will notice. If I can use my talents and my platform to spread awareness, then that will be my job. I believe we are in a crisis, and everyone needs a job. There are big jobs, like running for office, there are medium jobs, like organizing rallies, and there are small jobs, like making phone calls and writing letters and making protest signs. Nobody should do nothing. There is no excuse for doing nothing. 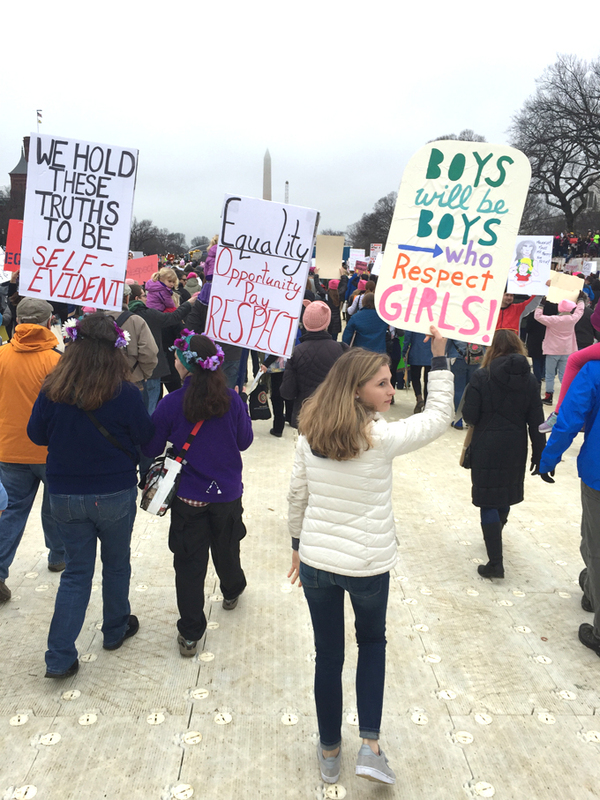 As Albert Einstein said..
My first march of 2017 was The Women’t March in DC. I took my 17-year old daughter with me. 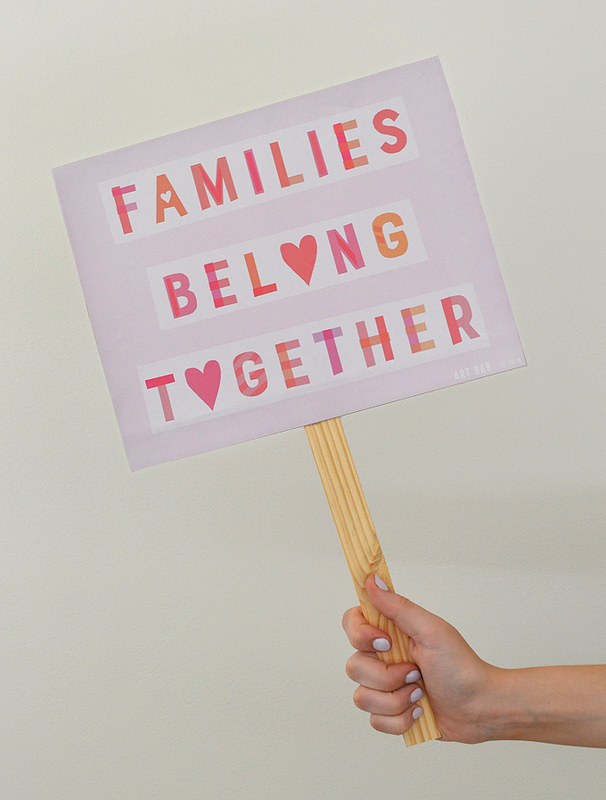 I made giant signs with hand-cut lettering that were colorful and fabulous, and I created a printable that lots of people used, and sold T-shirts and stickers. It was epic, an experience of a lifetime. I loved my signs, I still have them hanging up. But I spent a week making them, and now that I am going to protests at lightening speed, I needed to find a quicker way. 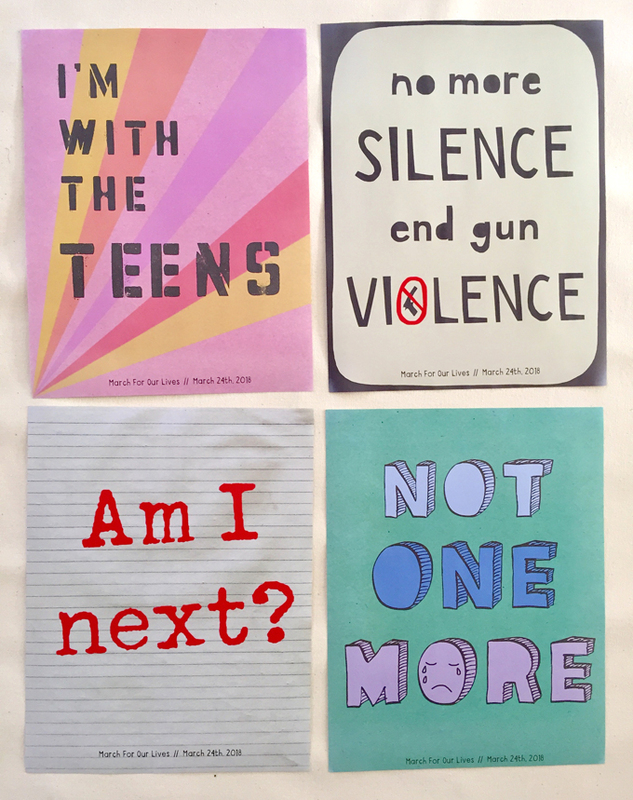 For our second march, The March for Our Lives, I made four more printables, and this time we glued them to cardboard and they were much more manageable. But I forgot about the backside. And since more people see what you’re holding up from behind you, the back is very important. So today, I think I finally have it right. I printed out two of my signs, glued them to cereal box cardboard, and then glue-gunned a paint stick in between. Voila! Easy peasy, and only takes a few minutes. 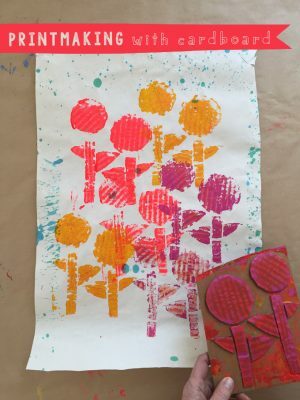 Glue printables on cardboard with a glue stick. 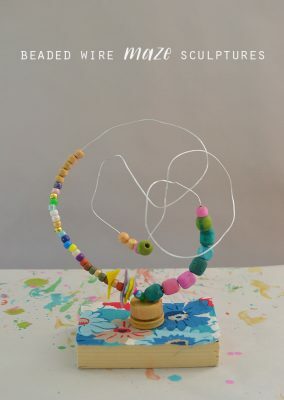 Use a hot glue gun to glue the back and front together. Don’t glue the bottom edge. Use more hot glue to adhere the paint stick in between the back and front. March with your sign and make a difference. 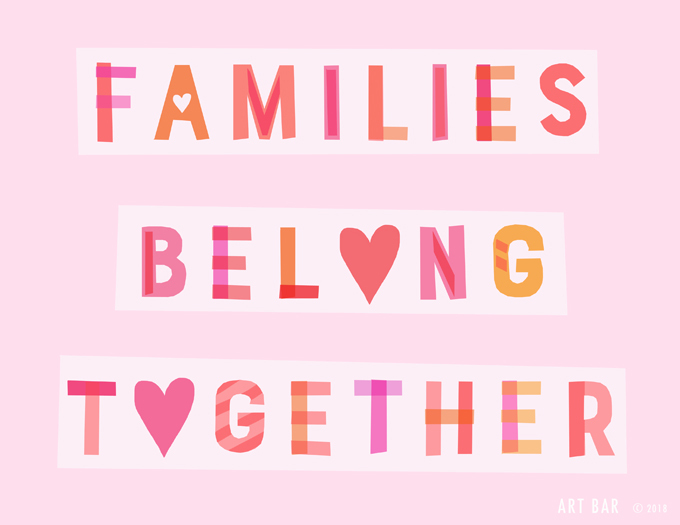 I am also selling buttons for $5 to buy art supplies for immigrant children in NYC. If you want one, just send money through Venmo (I’m @Barbara-Rucci-1) or PayPal (barbara@bruccistudio.com). And leave your address in the comments. You can also buy stickers, posters, and t-shirts through RedBubble. I feel really good about the fact that my daughters will be going off to college with the experience of standing up and marching for what they believe in. 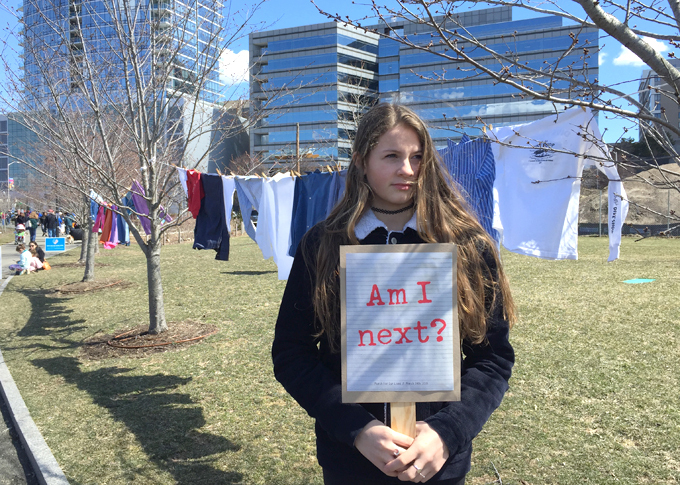 I think of my own apathy at their age, and I can say without a doubt that the people I am currently raising in this house will never hide or stay silent. They know what to do, and I’m proud of them (and me) for that. Good job Barbara. I am so inspired by this. 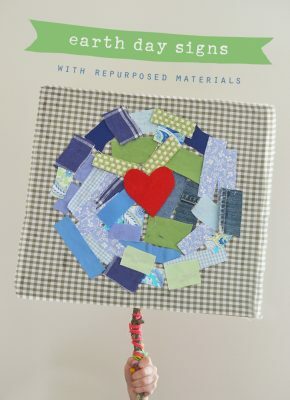 I love how you are just doing what you know and love, using your creativity and ability to craft, to inspire your kids and all your readers to be active, use their voice, to not stand by and accept injustice. And to raise money for Art supplies for immigrant kids in New york, that’s awesome. I will totally be buying one. Go you. Sorry, can I just clarify, the prints and t shirts that you are selling, does money from that go towards Art supplies for immigrant kids, or just the buttons? Protesting is so hot right now. It seems as if every week there’s a new fundamental human right being trampled, demanding a flood of opposition storming the streets. it’s hard to keep up, isn’t it? 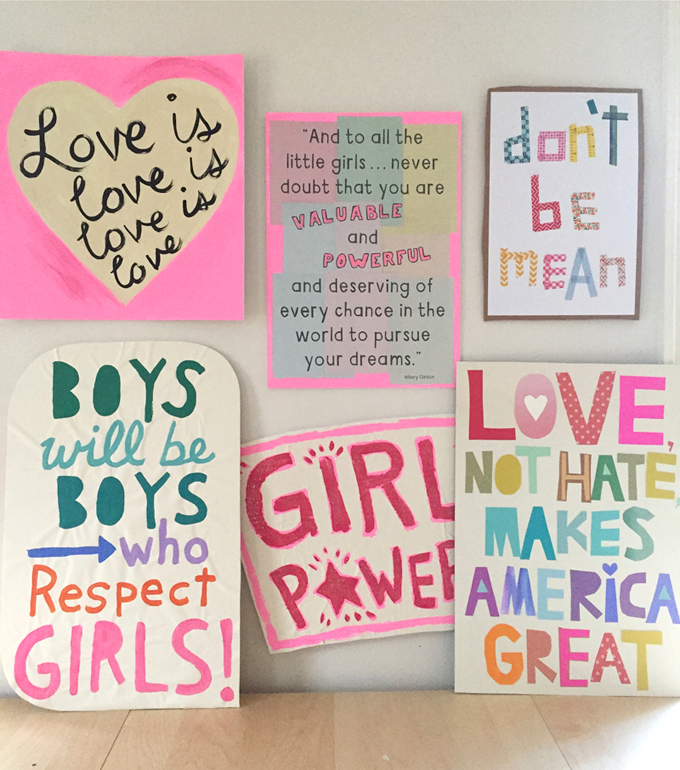 You’ve got some great tips for making protest signs. I’ve always thought protests were a good way to get across a point. 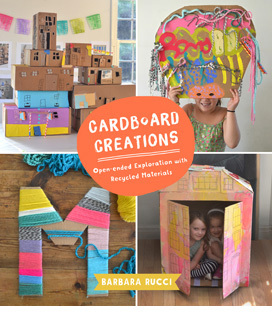 Using printables glued to cardboard is a great idea! I’ll keep that in mind for future rallies.